Part I is concerned with the classic topics of labor supply and demand, the size and nature of the elasticities between the two, and their impact on the wage structure. This analysis touches on two fundamental questions: what are the sources of income inequality, and what are the disincentive effects of attempts to produce a more equal income distribution ? The papers in Part II proceed from the common observation that the dissimilarity in worker skills and employer demands often tempers the outcomes that would be expected in frictionless labor markets. And the last section of the Handbook deals explicitly with the role of institutional structures (e.g. trade unions) that now form an important part of modern labor economics. Supply of Labor. Labor supply of men: A survey (J. Pencavel). Female labor supply: A survey (M.R. Killingsworth, J.J. Heckman). Models of marital status and childbearing (M. Montgomery, J. Trussell). Home production - A survey (R. Gronau). Retirement from the labor force (E.P. Lazear). Demand for education (R.B. Freeman). Forestalling the demise of empirical economics: The role of microdata in labor economics research (F. Stafford). Demand for Labor. 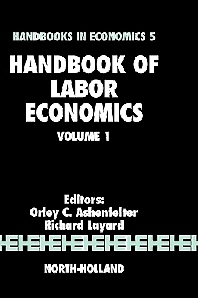 The demand for labor in the long run (D.S. Hamermesh). Dynamic models of labor demand (S.J. Nickell). Wage Structure. Wage determinants: A survey and reinterpretation of human capital earnings functions (R.J. Willis). The determination of life cycle earnings: A survey (Y. Weiss). The theory of equalizing differences (S. Rosen). The economic analysis of labor market discrimination: A survey (G.G. Cain).